Anta:pannello tamburato spessore 44mm, con struttura perimetrale in abete e riempimento con struttura alveolare; placcato sui due lati con mdf rivestito. Telaio: in mdf con profilo raggio 50 rivestito; con guarnizione di battitura e dotato di inserto in legno sul montante lato cerniera. I montanti sono intestati e preforati per la giunzione a 45° con il traverso. Sul rivestimento in Rov. Sbiancato, Palissandro: Grigio chiaro, Scuro, Bianco, White2, Tortora chiaro e scuro e Wengè, telaio con profilo raggio 3 e struttura in listellare di abete rivestito. Coprifilo: bombato in mdf rivestito da 70 mm con aletta telescopica 20 mm. Sul rivestimento in Rovere Sbiancato e Wengè, coprifilo piatto in multistrato con aletta 20 mm rivestito. Ferramenta: finitura ottone, con serratura patent e tre cerniere tipo anuba diametro 13. 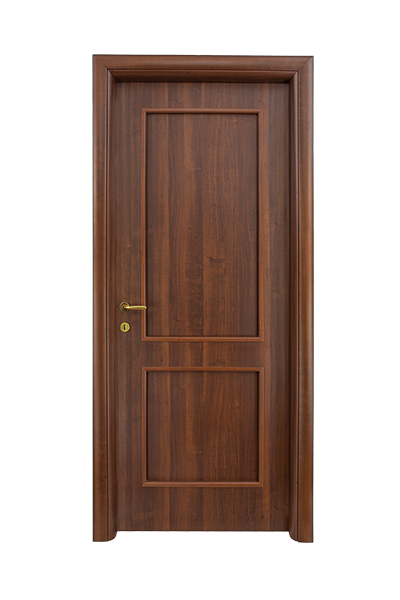 Door panel: a 44mm thick hollow door construction with a frame in fir and filled with a honey-comb structure, covered with MDF on both sides. Frame: made from MDF radius 50 covered, with rebate gasket fitted with a wooden insert on the side of the hinge. The lintels are perforated for 45° connection with the beam. In the Bleached Oak, Rosewood: Light gray, Dark, White, White2, Tortora light and dark and Wengé finish, the frame has a radius of 3 and structure made from laminboard. Casings: made from MDF radius 50 with a telescopic edge of 20mm. in the Bleached Oak and Wengé finish, available with a flat casing made from multi-laminate with a 20mm edge. Hardware: brass finish, with a Patent lock and three Anuba type hinges, diameter 13.